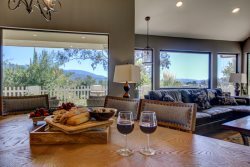 Elegant 3 bed, 2.50 bath single story home with gorgeous views overlooking the wine country. City lights at night and mountain views by day. Beautiful gourmet kitchen and large family room. Enjoy quiet patio for morning coffee or evening wine tasting. Master with a master shower that will be hard to get out of each day it's complete with 3 Shower heads, . Covered patio in back perfect for entertaining. Huge beautiful views. The gated entrance leads you to the winding driveway lined w/ lampposts, mature trees. There is a mature grapefruit grove on property. Entire property is fenced.